No no no, Reffen doesn’t work like that. Support our vendors, who are self-employed, and enjoy a delicious meal from one of them. Beverages can be bought in one of our bars, which offers a large selection of soft drinks, water, beer, wine and drinks. How do I get to Reffen? Many roads lead to Reffen. You can take the bike, bus 9A, port bus 991/992, hop on-hop off boats and buses or even your car. Read more about your transport options further down this page. Can I park my car at Reffen? Yes, there are plenty of parking spaces at Reffen. Remember to check out the signs for the parking regulations. There are no marked handicap parking spaces. Can I bring my dog to Reffen? Yes, you may bring your dog to Reffen as long as it is on a leash. However, be aware there are a lot of people at the market on warm summer days and only a few spots away from the sun. Can I buy gift certificates for Reffen? Yes, you can buy gift certificates in the bar called “Little Village” or by following this link. The gift certificate can be used in all stalls and bars at Reffen. Yes, you can book for a minimum of 5 people right here. We have plenty of seating near the water, on the terraces and in corners and hooks. Since all the booked tables are on the same terrace, we will – when you are less than 5 people – urge you to sit where you want, without being bound of a table reservation. When you are a party of 5 people or more, finding a place to sit together may be challenging, so booking a table may be a good idea. Where should I go when I have a table reservation? Please go to the bar called “Little Village”. It is the long black bar in the part of Reffen furthest from the water. Find the bar marked on the Food Map at Reffen. Where can I find information about event at Reffen? Stay tuned for events and happenings at Reffen on our event calendar. You can find the opening hours for the workshops/boutiques at the specific store. By default, the workshops are open during the same period as the food stalls. All food stalls and bars at Reffen only accept card payment. If you wish to pay with cash, you can switch them to a prepaid credit card in the bar called “Little Village”. You can always get unused money on the card refunded at Little Village. We do not have a “lost & found” service at Reffen. If you have lost an item, please contact an employee at the bar called “Foxy Bar” at Reffen, and ask for it. Harbour bus 991 and 992 sails on a regular service between downtown Copenhagen and Refshaleøen. 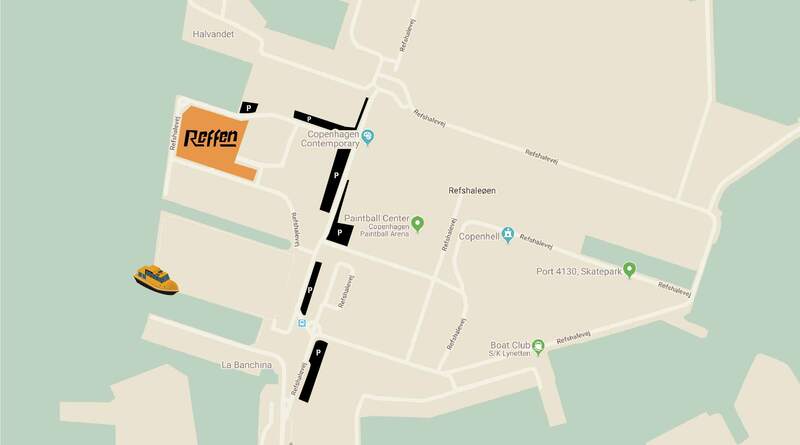 Find parking spaces at Reffen if you come by car. Remember to check out the signs regarding timeslots and payment.